Since I failed at blogging most of the week how about a Saturday post? I've been really digging neutrals since the beginning of the year. That's all I've been wearing to be honest is nudes, taupes, and muted colors. I can't get enough! I've been revisiting a lot of neutrals I haven't used in awhile including this Butter London. 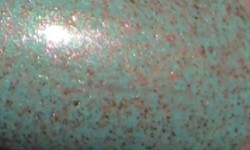 Two Fingered Salute is a dusty mint creme with rose gold and copper micro glitter. Color: I love it when I can say 4 years later this color is absolutely unique and original. This is definitely one of the most unique mainstream/high end polishes I own. I love the dusty mint green because it's chic and since it's so dusty it reads as a neutral. The real star of this though is that microglitter the green paired with the copper is gorgeous and gives off this unique antique finish. Formula: The formula on this was easy to apply and smooth. I used 2 coats above. Price: While this was a Nordstrom exclusive when it came out, it is listed on Butter London's website but isn't currently available. I'm not sure if it will come back or not. Overall: Two Fingered Salute is a beautiful color and well worth the high end price tag. It's a unique and sophisticated shade that I love! Look at that copper glitter!